All of the questions you have about Reality Clash answered here in the Reality Clash FAQs. 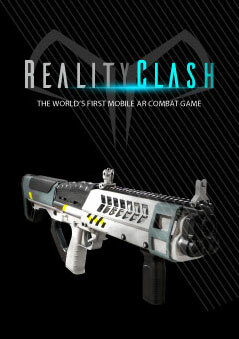 Info about the Reality Clash Armoury app and the upcoming Reality Clash game. What is the Reality Clash Armoury? The Reality Clash Armoury is the section of our website where you can buy exclusive, limited edition weaponry. Users can view all available weapons in 3D and use Reality Clash Coins to purchase these items to build up a powerful arsenal of their own or to use for speculative trading on the Marketplace. What is the Reality Clash Marketplace? The Reality Clash Marketplace is the platform on which all user trading takes place. There you can view listed weapons for sale from other traders. Any weapons that you put up for sale will be seen by all other visitors. All trades on the Marketplace take place via the Ethereum blockchain. To create an account, you will need to head to the 'sign up' page (in the top right hand corner of the page) and complete basic registration. Once that is completed, you'll be one step closer to becoming a virtual arms dealer and owning your own digital assets. What is a Reality Clash Gold Coin? A Reality Clash Gold Coin (RCC) is the only currency that you can use to buy weapons from the Reality Clash Armoury or Marketplace. The currency is an Ethereum-based utility token which provides an immutable public ledger for digital asset trading. Using RCC in trading ensures every item that you buy is 100% yours. There is no need to trust a central database or worry about fraudulent items being traded whilst all RCC payments are both secure and fast. How do I buy Reality Clash Gold Coins? You can buy RCC with a credit or debit card on our website here. Traders who are familiar with cryptocurrency can get their RCC from trading exchanges like Blockex, IDEX or Forkdelta. Links to these exchanges can be found here. You are also able to purchase RCC with ETH here. What can I use my Reality Clash coins for? The Reality Clash Coin is the only currency you can use to buy exclusive limited-edition Reality Clash weaponry from the Armoury. Once these weapons are sold out, they will not be released again. RCC is also the only currency that users can use to buy rare weapons from other trader’s at the Marketplace. More use-cases for RCC are also being developed. How do I transfer RCC to my Account? Copy the deposit address and then send your RCC to the address. How do I withdraw RCC from my Account? The ability to make a withdrawal is currently being implemented, users will be able to withdraw RCC from their account soon. Why should I buy Reality Clash Weaponry? These weapons are limited edition. Once sold out they will never be available again. Trade them soon and make real money or simply keep them for tactical advantage in the game. I have sent RCC to the Armoury payment address but not received any confirmation email? I've bought a weapon, what can I do with it? Where can I see it? Congratulations! After your purchase, you will receive an email containing details of your order and the attached certificate of ownership. Your weapon will be available in your Reality Clash account and will appear in the ‘my Armoury’ section of your profile page. You can list your weapons for sale on the Marketplace at any time and in the near future – you will be able to take them into the Reality Clash mobile game. How do I sell my weapons on the Marketplace? Choose from the list of your weapons and place an item for sale at a price decided by you. Sometimes this process can take more time depending on the business of the network. How can I prove that I own this item? Included in each weapon certificate is a unique serial number. As the owner of this asset, only your account has control of the item with this unique identifier. This data is part of the asset information that is recorded on the Ethereum blockchain during the tokenization process which follows your purchase. Can I use these items in the Mobile Game? Yes! This feature is coming with the launch of the game and you will be able to take your weapons from the trading platform and use them in-game against your enemies. Show off your power and style with these limited edition items.